Technology has grown to an era where everything especially home chores and cooking is becoming very easy to do especially with recent inventions. The technology has extended to the level that even the use of a knife has been made very sophisticated with electric means. If you are a fisherman, hunter or any profession using knives for domestic purposes, there is always an electric knife for nearly every cutting job and they make work very simplified. There are great selections of electric knives made for different purposes that have a variety of blade lengths, safety features and power sources made perfect for your cutting needs. The Black and Decker EK500B 9-Inch Electric Carving Knife has two distinctive features that make it very ideal for use. First, it has the ability to cut chicken perfectly leaving it with a presentation-worthy chicken and also slice through bread perfectly. When it also comes to slicing cheese, you can depend on this uniquely made electric knife for that perfect cut. Apart from this wonderful feature, the round handle makes it fit and stay put perfectly to the hand even when it is fully covered in chicken grease. With little to no vibration this electric knife creates, the finger can be kept locked onto the trigger without slipping while using it to cut through foods and also with a quiet or noiseless profile that makes it completely pleasant to use. Other incredible features are the Dishwasher-Safe Removable Parts, Safety Lock Button that prevents the knife from turning on while it’s plugged in, and Blade Release Button that aid in unlocking the blades for easy removal. Knives are tools that can easily cut us and cause injury to us, that is why this electric knife has a safety lock feature that keeps the blade in place to ensure that you are safe from cuts. This powerful motorized slicer knife also comes included with two heavy duty stainless steel blades made exclusively for durability. Not only is this electric knife portable and handy, but it also features an Ergonomically Designed Handle for Comfortable Handling and carving with ease. A great bargain knife that has no issue cutting through foam, bread or meat. Comes with a useful storage case. Users must press and hold the button while cutting, which can be difficult for those with weaker hands. With this electric knife slicer, you can make a uniform slice of anything you want to cut as it has reciprocating dual serrated blades and carving fork to add precision and power to any slicing task. 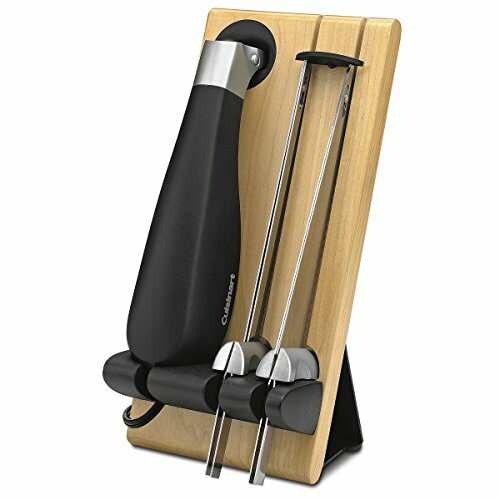 It has an ergonomic handle that makes easy right or left-handed use, carve meats, cheeses, bread, and other food products very easy. Not only does this ergonomic knife cut various meat, such as large roasts, turkey, chicken, ham, and steak. It can also be used to slice bread, fruits which may include small to medium-sized melons and pineapple; vegetables, such as tomatoes and eggplant making it perfect for holidays. For safety use, this knife has a one-touch trigger control power switch with an integrated safety button which locks the knife when it is not in use and prevents accidental blade activation. It also has a storage case for safe and space saving storage. With the dishwasher safe parts, all you need to do is to press the easy blade release button to remove the blade and carefully wash or put in the dishwasher. The Cuisinart CEK-40 Electric Knife is made of high-quality stainless steel blade that is very sturdy to easily cut through the toughest of meat parts with absolute ease. Comes with a wood block storage tray to keep the knife safe and out of reach of children after use. Includes bread blade, carving blade and butcher block holding tray that makes the use of the knife very easy and safe. The ergonomic handle of this electric knife makes it easy to hold and work without slipping out of the hand even when the hand is wet. The blade is also made with an anti-rust property that makes it remains sharp for use over a long period of time even with constant contacts with water. Has a one-touch safety lock and easy release blades. Backed by an impressive three-year warranty. It is a bit tasking trying to cut through a turkey, ham or roast beef with a basic carving knife. You can painlessly cut meat with this oscillating, double-bladed and powerful electric knife which makes cutting meat not just easy but very precise with little to no effort required. Do you wish to make a perfect cut on your warm, crispy baguette, a homemade loaf of light white? then you can rely on this Hamilton Beach Electric Knife to let you slice a wide variety of bread without compromising their texture. The stainless steel blade never needs sharpening and removes easily for quick cleaning. It also comes included with a stainless steel fork that lets you go straight from carving to serving. The compact case it comes with allows you to store the knife neatly in one small space. It has a stainless steel blade that is easy to remove and clean. Comes with a carving fork and storage case. Some of our testers found that the on/off button is somewhat awkward to use. This is another Hamilton Beach product that is made of exclusive and sturdy extensive blades that makes slicing of meat, cheese, and bread perfect. It is no doubt a perfect addition to your kitchen tool as it makes all cutting tasks extremely effortless. This electric knife will make your holiday roast look very impressive with a perfect cut. It can also slice out your artisan bread, meats and cheese to create a deli classic at home. It also allows you to make a precise cut effortlessly as it is made of a comfortable and easy-to-grip handle. The stainless steel blade never needs sharpening and can be easily removed for quick cleaning. Also comes included with a storage case that makes it simple to keep everything together in one small space. You can carve and cut through meat like a professional and a master with the Oster Electric Knife that comes exclusively with Carving Fork and custom storage case. With this electric knife, your cutting of meat and other food product is made with ease as it has the ability to slice through roasts effortlessly and precisely for serving meats and poultry to perfection. For easy cleaning after use, the stainless steel cutting blade is made removable. Not only is the blade made very strong to last long but it is made with special anti-rust properties. For easy, comfortable, and safe use it is ergonomically designed. Why make a mess and rough cut on your meat or poultry when you can easily use this electric knife cut through without making a compromising texture. Has sharp edges that can easily cause cut to the hands. You can fillet easily as even big bones can never slow you down while using The PRO Series motor boasts 2X more torque with the heavy duty feature it is made of. It is made with Superior Drive Train components and design that gives it 4X the lifespan of any other “Heavy-Duty” Electric Fillet Knife. This device is made unique with an Advanced airflow design that makes it PRO Series with an ergonomic handset cool for hours of continuous filleting. The Electric Fillet Knife PRO series handset is compatible with all variations of American Angler Replacement including the 8-Inch Curved Replacement Blade and the 8-Inch Curved Replacement Shark Blade Blades so you always have the perfect blade to fillet your catch. Has a rugged tool that boasts 110- volts of power. Has a streamlined handle and five interchangeable blades. Designed specifically as a filet knife. You will require a little force to cut through bread with this electric knife as the blade is not too sharp but safe to use. When it also comes to slicing cheese, you can depend on this uniquely made electric knife for that perfect cut. 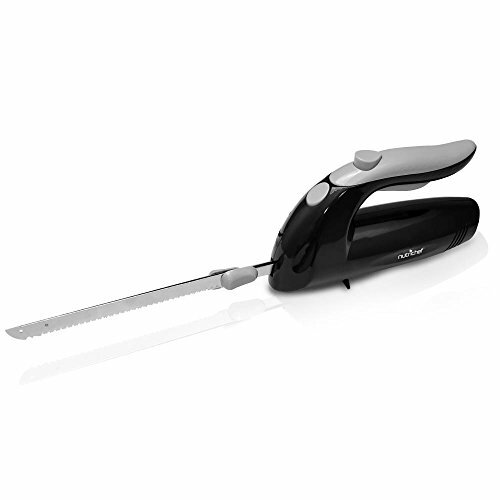 Apart from this wonderful feature, this product is made with a comfortable handle that makes slicing easy and fast. You have to be very careful using this knife because it can easily slip out of the hand when it becomes greasy with chicken fats as it is not very handy. It is a budget-priced electric knife that is cost effective and cheap compared to other products. The ability to make a precise and clean cut on meat, cheese, and bread make it a good knife to use and the portable design makes it easy and light to hold. With this deluxe electric knife, you can work anywhere you are. Made of a powerful and quiet motor, with advanced airflow design which makes any fillet work very fast and effortless. Come included with this electric knife is all adapters for plugging into any kind of wall outlet connecting to trolling motor battery posts or plugging into car or boat lighter outlet for full filleting power. Set includes both 6″ And 7-1/2″ Reciprocating blades which is the right sizes to match your filleting job. For easy storage, everything fits neatly into convenient travel case that it comes with. The blade is made of stainless steel; it is highly resistant to rust even with constant touch with water and other liquid sources. It has a relaxed grip body that makes it easy to hold and work with. Before you think of purchasing an electric knife you must, first of all, put the benefits into consideration. With an electric knife, the slicing of your meat will take a limited amount of time as the electric knife’s blade move so quickly to cut junk of meat as compared with the traditional knife. The electric knife is safer than the traditional one, it is easier to clean and has grips that help avoid accidents. With an electric knife, you can get precise, accurate slices every time you cut. Who needs an electric knife? Before going to get an electric knife you must consider first the type of work you do and know if there is a need to get it and also know the type that will meet your demand. You should know that has the ability to cut different kinds of food but it is unique for slicing food like meat and bread. You are going to benefit very well from electric knife if you often cut through turkey, chicken, roasts, or loaves of bread in your kitchen. 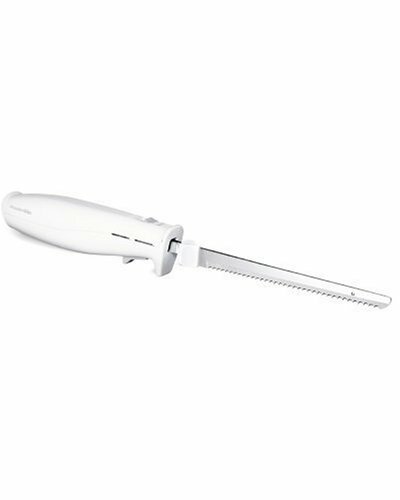 If you have arthritis or other hand issues because you don’t need to apply as much pressure or force when you use one you can gladly go for an electric knife and it is exceptionally great for chefs. In respect to your need and for safety purpose electric knives are available in both corded and cordless models. Corded models must be plugged into an outlet for operation, which may limit the locations where you can use the knife and same time pose threat of shock. Cordless models operate on batteries, so you can use them anywhere. Some cordless electric knives are rechargeable, which allows you to plug them in for charging and unplug before use. Corded models tend to offer more consistent power because cordless models can slow down as their batteries weaken. However, cordless models offer better maneuverability. Depending on your demand, you might want to consider the blade of an electric knife before you purchase as most electric knives feature different types of interchangeable blades that you can remove one and replace it with another one depending on your slicing task. Look for models that include a carving blade for meat and a slicing blade for bread or cheese in respect to your demand. For effectiveness, go for knives that have 8 to 9-inch length. Longer knives are also suitable and increase flexibility around bones and other hard parts of meats. For long-lasting use or durability, go for models with stainless steel blade, which is also resistant to rust and cannot easily bend. Always go for models that has an ergonomically designed handle that fit your hand’s contour for comfortable grip because the motor is housed in the handle making it vibrate during operation which can hurt the hand. You might want to change the speed of your knife in respect to the type of food you are cutting. You should always go for models with variable speed control, it will help you increase and decrease the speed to get the exact type of cuts or slices that you want. For easier slicing and securing of the meat you are cutting, many electric knives come with a carving fork, so it is better to go for the ones with this feature. For easy storage, you can choose ones with storage container to place the knife in when you put it away. It also creates safety. An electric knife poses more danger than the traditional knife because of its motorized blades. It is better to go for knives with safety blades to avoid accidents. The locks prevent the blade from moving accidentally when you are using the knife. The prices of electric knives vary based on the type, blade heads, and accessories but they all come with moderate prices. So you will have to consider the features in respect to the task you will be needing the knife for before you go for anyone. For home uses, you can go for ones with lesser prices but for bigger tasks, you can go for higher ones. You should always go for electric knives with carving forks as meat can easily shift under the influence of an electric knife. Electric knives are very exciting to use but to get the best use of them, we must use them appropriately. We should cut or slice in a downward motion, pull to avoid sewing the meat or bread. Never immerse the electric knife in water to protect the motor. The blade should be removed for cleaning and the handle can be wiped with a damp cloth.